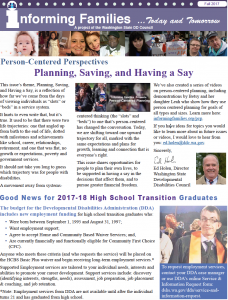 Our printable fall newsletter offers information and resources for children and adults with developmental disabilities and their families. 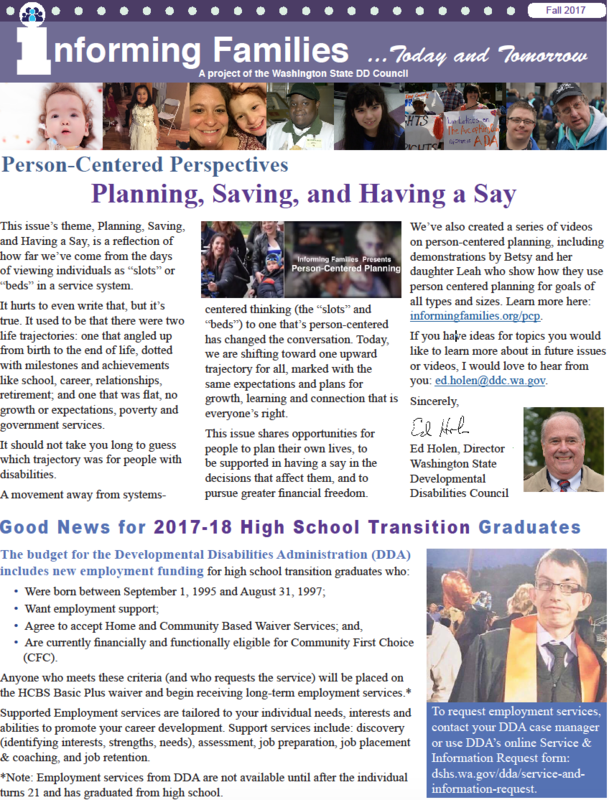 Announcing funding for 2017-2018 high school transition graduates. No one wants to live below the poverty level, but for people with disabilities who need government services, it’s a requirement for receiving Supplemental Security Income (SSI), which is the gateway to Medicaid health care (Apple Health) and other services that most people with I/DD need to live and work. Learn about two options for saving and investing in Washington State: ABLE and the DD Endowment Trust Fund. My Life Plan, a free online planning tool that uses a person-centered approach to plan for every stage of life, received a fresh new look and extra options with a recent update released this past summer. Learn more about this free, flexible, and secure planning tool. Supported decision-making reflects a growing movement that recognizes the need to help individuals understand information and make decisions that affect important areas of their life, such as legal, financial, medical, housing, education, and relationships. It’s a self-determined approach to helping people understand their choices and have their voice be heard and respected. Fall tips for self and home health and safety.